But that does not mean that the prices of individual stocks all follow the same directionless pattern. The chart below shows the percentage change in the prices of two popular technology stocks, Apple and Amazon, from early January to late April 2014. While both stocks started the year with losses, declining by 10% (Apple) and 13% (Amazon) by late January, Apple went on to earn a positive return (+4%), while Amazon’s stock has continued to slide, accumulating losses of almost 24% over the same period. The two companies’ very different reactions to their recent earnings announcements in late April can be seen in the chart — Apple’s stock gained almost 8% in one day, while Amazon’s declined by almost the same amount. 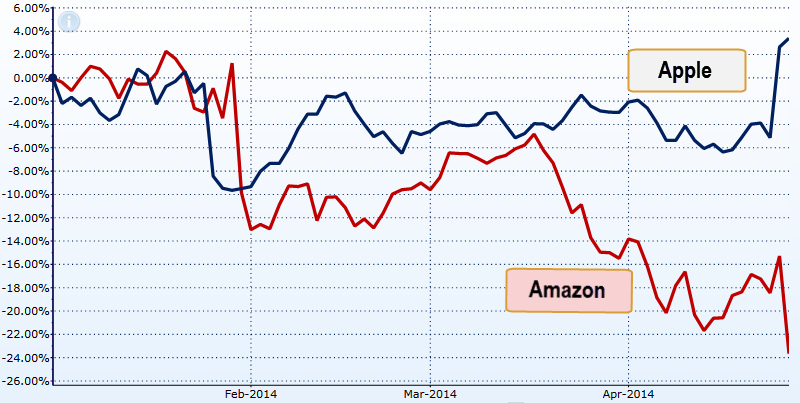 What caused these two tech giants to have such different returns thus far in 2014? 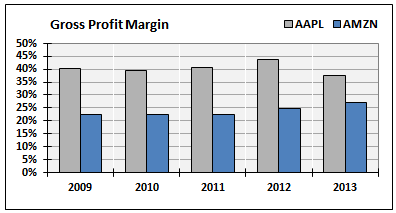 The answer has to do with the ability to grow profits and earn a sufficient return on the capital invested in each company, usually referred to as a company’s “fundamentals.” The next graph compares each stock’s gross profit margin, which measures the percentage of sales revenue left over after covering basic costs. The companies look competitive, with Amazon gradually expanding its gross margin. 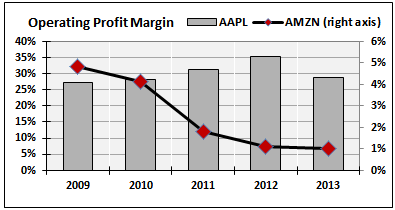 Apple posts a consistently positive operating margin that fluctuates between 25-35%, while Amazon’s starts out low (below 5%) and deteriorates further, all the way down to 1% for fiscal year 2013. Worse still, Amazon has pre-warned the market that it is likely to lose money in the 2nd and 3rd quarters of 2014, with the possibility of even further deterioration in its operating margin. The market clearly disapproves of this trend, and has reacted by punishing Amazon’s stock price. The next graph compares Apple and Amazon based on their return on invested capital (ROIC), which measures the change in value of each dollar invested in the companies over a full fiscal year. In order for a company to grow its value, its ROIC must be greater than its cost of capital, or the minimum return demanded by investors each year. While the cost of capital can vary widely, from as low as 5% (for the safest companies) to as high as 12% (for the riskiest companies), the return on capital must always be above the cost of capital, or the company is decreasing the value of investors’ capital. 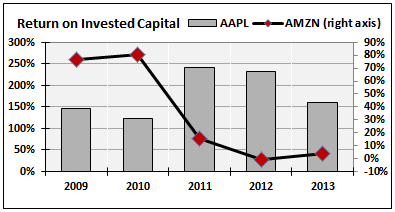 When it comes to return on invested capital, Apple is amazing — it has been increasing the value of investors’ capital for years. While Amazon earned a healthy ROIC in 2009 and 2010, their ROIC has evaporated in recent years, even turning negative in 2012. And, based on Amazon’s recent announcements, investors can expect continued substandard performance from the company for at least several more years. Therefore, although the brand names “Apple” and “Amazon” evoke similar admiration among consumers, when we “open up the hood” and view the companies from the perspective of an investor, we quickly see that we are dealing with two completely different cases. Apple is not only an exemplary brand, but a strong and profitable company. Amazon, on the other hand, is suffering through some major growing pains as it tries to wean consumers away from the deep-discount/free shipping mentality that is the root cause of the company’s lack of profitability. Based on the dramatic declines in its stock price so far this year, the market apparently remains unconvinced that Amazon will be immediately successful at restoring its profitability to acceptable levels. removal, tattoo removal and to treat scars or hyper pigmentation. The face lift surgical procedure engages in tightening of the facial and neck muscles. food. It helps more when you have a fitness or weight reduction buddy. Your site provided us with valuable information to work on. You’ve done an impressive job and our whole community will be grateful to you. s darkened, so be sure to be safe rather than sorry, and don. Taking this drug with coffee or tea is not advised.